Simon Sjøthun, Project Manager, Rystad Energy. With a wide array of commercially robust projects in North West Europe, do expectations suggest a new development boom? Oil production from shale formations and increased uncertainty around future demand for oil has created less visibility around the viability of long cycle offshore oil production and exploration projects. North West Europe, a predominantly offshore region, will also be impacted by these large macro trends. Three lenses can be used to examine how we can think, observe and assess the different supply segments of oil and how they compete for available capital and resources. The first lens looks at how decision criteria has evolved from volume-based metrics like production targets and reserve replacement in the US$100/bo era to profitability indices, dividend protection and cash preservation in the downturn. Downturn behaviour penalises long cycle offshore projects, while upturn behaviour enhances emphasis on long cycle-friendly decision criteria. This means that frontier regions in North West Europe – the Barents Sea and West of Shetland – will suffer the most. The remaining areas in the North and Norwegian Seas are covered by infrastructure, a key enabler for short-term projects offshore such as infill drilling and tiebacks. The second lens is resource availability, as not every company can access all available resources. The most profitable resources are locked behind national oil companies, while shale resources require a vastly different business model than conventional oil. We observe that transaction multiples have increased for shale resources and decreased for North West Europe resources, implying an overly high entry price to the North American shale world, locking out offshore-focused players without an established shale activity. These companies have a limited investment arena and North West Europe offers one of the few conventional OECD production sources. The third lens looks at transaction and portfolio opportunities. 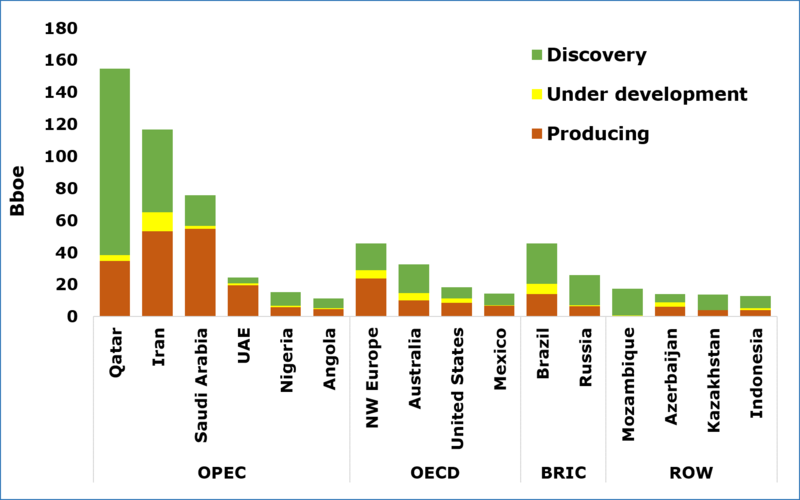 Only a subset of companies can allocate capital to a wide array of projects in all oil supply segments. Transaction history for majors and big international oil companies gives no clear indications that offshore is divested in favour of other segments, suggesting that it is still considered attractive despite the short cycle and payback time characteristics of shale oil. From a full cycle perspective, offshore projects can compete with equal or better breakeven levels. The only clear indication that transaction history reveals is divestment of oil sands. Countries or regions with remaining discovered offshore resources greater than 10 Bboe: North West Europe has the biggest OECD resource base. Source: Rystad Energy ECube. These three lenses teach us that understanding capital allocation and its implications on offshore supply, transactions, field developments etc., is complicated. Observations made around the few companies able to work across all oil supply segments do not support any widespread move away from long cycle conventional offshore projects. North West Europe, as one of the leading offshore regions globally and with OECD exposure, should therefore expect to see continued capital and resource allocation as long as projects are competitive. Given the wide array of commercially very robust projects in the region, the expectations suggest a new development boom. However, recent poor exploration results have not filled the project portfolio, potentially creating declining activity past 2020. What Lies Beneath the Deepwater Tano Basin? Following on from his article about the prospectivity of Jamaica in GEO ExPro, Vol. 7, No. 6 Chris Matchette-Downes moves westward to take a look at the eastern part of the Central American country of Honduras. He argues that the petroleum geology, particularly potential source rocks, has important similarities – but exploiting any hydrocarbons is not going to be easy.